It will be an arcade game set in the fantasy world (so I decided to put it here). There is a greedy dragon sleeping on a piles of looted treasure and the hero, who will try to steal them (player takes the role of hero). However, this is not as simple as it seems to be. Huge chunks of rock will randomly drop at the hero’s head. Moreover, “The Eye” of dragon opens from time to time and the player has to hide before the dragon wakes up. To achieve a high score player needs good tactics and skills. Amateur sketch shown below will help you (or at least it will try) to imagine how the game will look like . Final graphics will look more professional. Graphics should be ready in a few days, however, until they are not finished I will present the process of creating the game on such scribbles. Do you like the idea? Would you like to play this kind of game? Or maybe you have an idea how to do it differently – better? Any suggestions and questions are welcome. The game will be ready probably around December 13. Keep checking this topic if you are interested in the development process. I sincerely hope that this is the right place to share my own creative work. Last edited by S.G on Sat Dec 20, 2014 8:32 am, edited 2 times in total. 1. The eye keeps opening randomly - the player must react accordingly quick. 2. 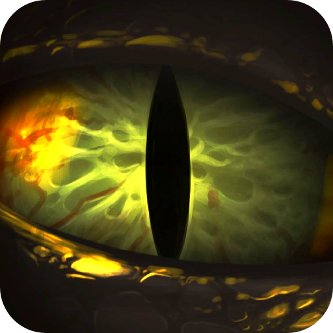 The eye keeps opening as the dragon's anger increases gradually (there is a bar indicating anger levels) - the player has to hide in order for the dragon to fall asleep again. I decided on an option where the eye keeps opening as the dragon's anger gradually increases, with the player having to hide in order to decrease the anger levels. This option allows to minimize the randomness of the gameplay. And here is another video. 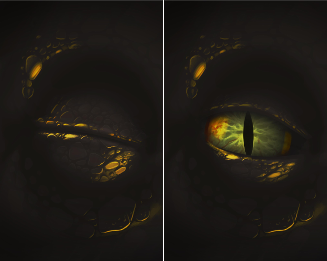 The eye opens only when the dragon's anger bar is full. I think that I'll be able to add the ability to hide by tomorrow. As I promised yesterday, I added ability to hide, which will be used to decrease anger levels. Anger bar will decrease very quickly if you hide (not like in the video - it's just a prototype, I need to adjust all parameters). Professional graphics of the titular “eye”. How do you like it? 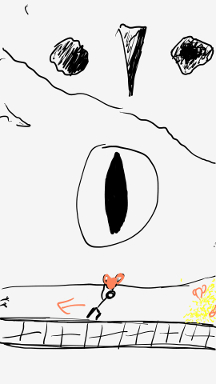 Today I made an animation of the eye. What do you think? And here is an animation of the character. How do you like it? Menu prototype. What do you think? If you are interested in supporting the project, please ‘like’ and share with your friends . Today I would like to present you the final version of the menu. Here is the official trailer. "The Eye" will be released tomorrow, stay tuned! Finally! The game is finished. A lot of hard work, far too little sleep, but it was worth it. Thank you very much for your attention, valuable comments and opinions . Download, play and share with your friends! Welcome to TORC, S.G. Please check your email for some information. I have not received any mail yet.